This step was very exciting as it is a big step. When the tailcone is attached you get a great sense of accomplishment as you look at one of the major structures coming together. Starting off this section requires to final drill holes in the forward bulkhead of the tailcone. In addition to utilizing a uni-bit to enlarge holes where ultimately the cables for the rudder controls will pass through. Mine already had them done. Removed the bulkhead, deburred and dimpled the holes per instructions. 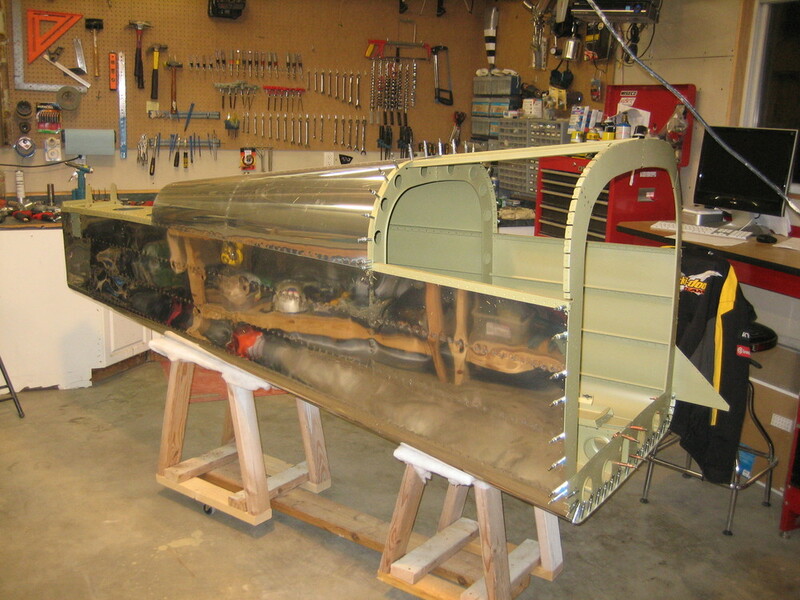 Removed the F-1006B bulkhead from the tailcone and clecoed to the baggage ribs of the forward fuselage. Then attached the tail cone to the forward fuselage. Looks really cool at this point. Final drilled all the holes between the two. Then drilled the four holes on each side that attach the forward and rear longerons. Reinstalled the tailcone forward top skin once again and match drilled through the shims into the sideskin. At this time you also match drill the remaining holes through the side skin into the forward fuselage longeron then counterskink these holes. Did the same process to the bottom area of the baggage door. Now that everything is match drilled I separated the forward fuselage and tailcone so that all the holes could be deburred and dimpled where necessary. Once this was done I re clecoed the tailcone to the forward fuselage. Per the instructions got all the rivets installed between the two parts. For the amount of accomplishment this steps goes very quickly. Now that it is pemanently attached, time to stand back and admire over a beer.